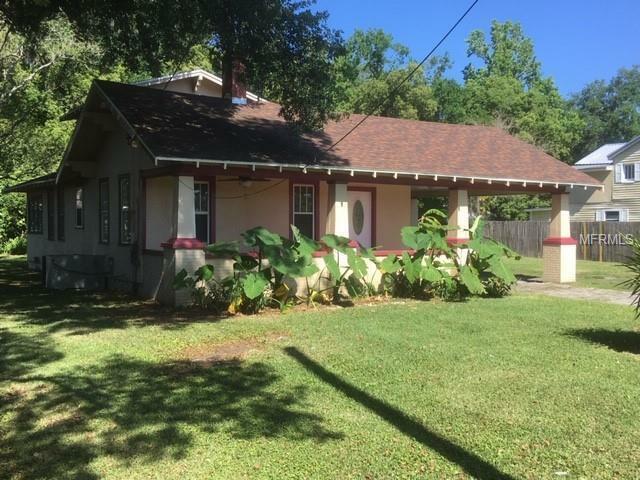 Charming Florida Bungalow , updated and MOVE-IN READY. Bring your rocking chair and enjoy the breezes on your beautiful covered front porch. Kitchen includes NEW STAINLESS STEEL appliances, updated cabinets, dinette/breakfast nook and wood look CERAMIC TILE. Bedrooms are ready with NEW CARPET and ceiling fans. Work or relax in your own cozy study next to a downstairs bedroom or retreat to the second floor for a room with a panoramic view ready to be used as a bedroom or studio. NEW ROOF with architectural shingles in 2015, UPDATED ELECTRIC 2015, NO HOA, oversize lot (over a third of an acre). Convenient location with shopping, medical facilities, hospital and post office close by. Interstate access to Tampa or Orlando is just a short drive away. Modern conveniences with all the charm and appeal of this historic home makes this home just right for you to see. Schedule your showing today.